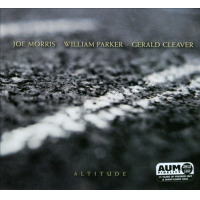 Of all the possible combinations and permutations of modern improvising jazzmen, it's a wonder that the trio of guitarist Joe Morris, bassist William Parker and drummer Gerald Cleaver have never worked together as a unit. Luckily in 2011, at the urging of label chief Steven Joerg, the trio got together for two sets at The Stone in New York as part of a two-week AUM curated series. Much like on Cleaver's previous release with Parker and pianist Craig Taborn entitled Out of This World's Distortions (AUM, 2011), this ensemble performs in a seemingly leaderless fashion. Each player subscribes to the one-for-all and all-for-free principles. That is, each player pulls the music in different directions while simultaneously listening and reacting to their partners. Those last two notions (to listen and react) are so very important in maintaining the energy throughout the four long-form improvisations. The two sets are distinguished by Parker swapping his bass for the sintir, a Moroccan three-stringed lute. Morris defers the bass lines to Parker, sticking to electric guitar and his signature rapid hard-scramble sound. Opening track "Exosphere," clocks in at over 26 minutes and is a marathon of a piece, taken at an accelerated aerobic pace. Morris silences his guitar at the 11th minute and a breath is finally taken. Cleaver stirs the pot throughout in a constant bustle, while Parker applies wave upon wave of energy. Piece-by-piece the trio builds their three way dialogue, forgoing the classic model of building tension followed by release. They maintain a constant exchange throughout. With Parker on sintir for the second set, his vocalizations permeate the affair, but the energy remains. The liner notes remark that the player's clothes were soaked through from the effort. Such is the experience of this exhaustingly pleasurable recording.